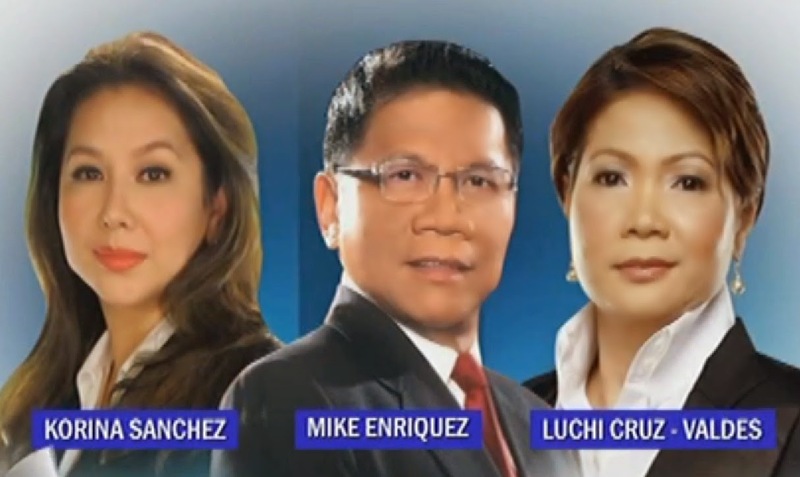 TV journalists Korina Sanchez, Mike Enriquez and Luchi Cruz-Valdes denied that they received pork cuts from pork barrel queen Janet Lim Napoles, as published in Nancy Carvajal's report on The Philippine Daily Inquirer. The three released separate statements Sunday denying any involvement in the Priority Development Assistance Fund scam and debunked falsehoods put forth by the PDI report which listed them as among the mediamen who received payout from Napoles. Sanchez said she did not receive any such gift, in cash or kind, from Napoles or her company nor through emissaries then and up to now, and called Inquirer's report an "unsubstantiated lie." She added that she only met Napoles and her family late last year after doing an interview with the alleged pork barrel queen. "I had never met Ms. Napoles nor had any associations with her, her family, her employees or associates before then, nor after my interview with her and her family." Enriquez, meanwhile, said: "I vehemently and in the strongest of terms deny knowing Janet Napoles at all and just as strongly deny receiving any gift in whatever form from her," adding that both his personal and professional conduct is in "strict adherence to the GMA code of ethics and to the values of hard and honest work, decent living and service to God and country." His home network, GMA, also called the report "uncorroborated and bare," adding that there is no reason at this time for the network to take the report seriously. "Mr. Enriquez had always adhered to the high level of professionalism required by GMA and it stands by him in the face of these baseless imputations,” the statement reads. For her part, TV5's Luchi Cruz-Valdes said: "I deny and denounce any imputation or suggestion that I benefited in any way from the PDAF funds facilitated by Mr. Benhur Luy," adding that over the course of her more than three decade career as a journalist, she have never received any gift from any party in exchange for any kind of consideration in news coverage. "I denounce the reckless inclusion of my name on a list that has no legal legs to stand on," she said.